Here's the thing, I'm not a lipstick person but I can not deny the fact that for most women, that includes me, not wearing a color on your lips seem to make your look incomplete. Had to admit, that due to lack of ample time to prepare for an event where you needed to look at your best or just a bit nicer, sometimes considering how your lips would look are often shrugged off. Like most moms, who only have a few time for themselves, wearing make up have been such a duty, specially if you don't have a comprehensive know-how. Unless you have the skill and guts of this last lady in the video. Many women, if time-pressed, a lipstick will do fine to add that pop in your face. It really does the trick, specially on occasions when you feel lethargic or anemic. However, for foodies like me, the issue with lipstick is significant. It's not a question anymore of whether you'll put on whatever color you want, the issue herewith is if it would stay on after a bite or sip or two. 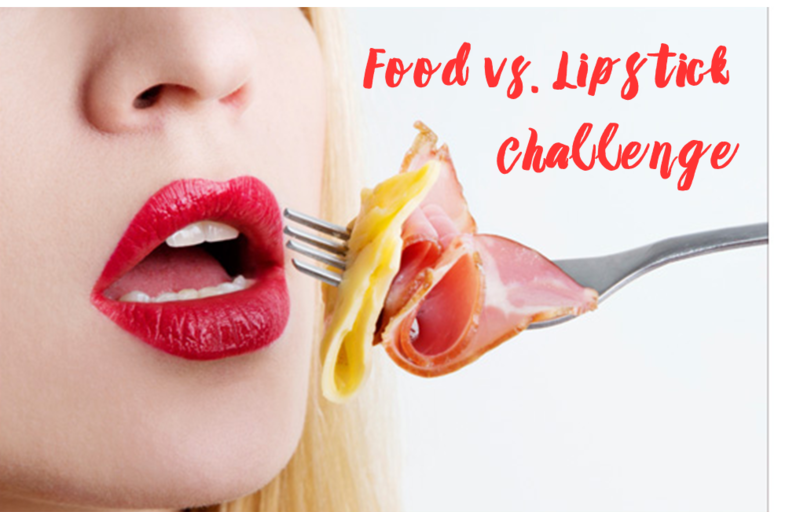 I'm a food-blogger if you still haven't noticed, not a hard-core beauty blogger, though I have written considerable amounts of reviews of some beauty products, though reviewing a lipstick brand is ticked off in my list. It still leaves me with this bugging question whenever I apply a lipstick before I go to review a restaurant. 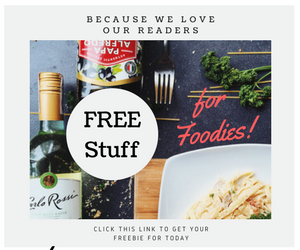 Probably many bloggers would relate to this, case in point: how many times have you had the experience of having a group photo after an event which entailed lots and lots of eating? This also goes to those who attend events with loads of feasting and drinking. Why is it that photo ops happen at the end of events when your hair is already everywhere and with terribly faded lipstick. This prompted me to ask a certain beauty blogger about a good lipstick brand that can stand such tests and would not leave you looking less of a color on your lips. Whether you'd be having a coffee meeting, attending a wedding or a birthday, partying all night or eating out with a date, at the back of every ladies' mind is "do I still have my lipstick on?" 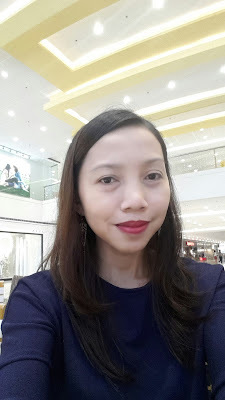 With that in mind, I decided to partner with a lipstick junkie, who happens to be a mom like me and a blogger who fared to do unabashed reviews of local brands (though she also have reviews of top imported brands as well)- Monika de Veas of Lipsticks and Moe. 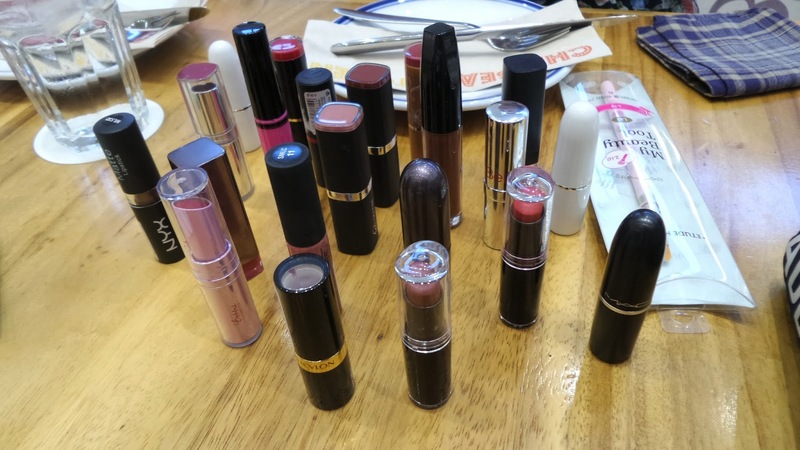 With a theme at hand, I asked Ms. Mela of Raintree Restaurants to host a blogger-get-together where bloggers can try some of Monika's Collection of lipsticks. 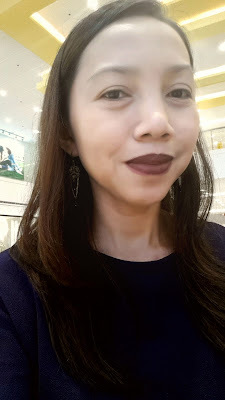 And yes, since I'm on a look out for fail-proof lipsticks that can make me cross out embarrassing faded, bled and smudged lipstick before that dreaded last minute photo op, we went across the board and tested them out. Of course, the best thing to test the lipsticks on us, is with a hefty lunch with dishes that are rich, colorful, bursting with flavor and smothered with savory and creamy sauces and some beverage to pair the dishes with. One best restaurant that fully satisfied our needs for such an eventful meet-up was at Chelsea Kitchen. All of us girls loved the vibrant, fresh and cozy feel of the Chelsea Kitchen even though it's smacked right at the entrance of Mega Fashion Hall. Positioned strategically in an open concept brings out the modern kitchen vibe, as if some Ginny in a bottle caused a modern and beautiful kitchen to appear at the floodgate of fashionable mall. Hues replicating the zesty colors of nature such as oranges, yellow and greens are thrown everywhere in a lovely mix. Mismatched tables and chairs brings out its funkiness and playfulness in the interior but in an elegant scale, kind of sends out a message that their menu is styled in that manner. Lots of lights beaming in the room, perfect for capturing your beautifully plated dishes. I so love the open kitchen concept, brings out the HGTv-mom in me. HGTv stands for Home and garden TV, btw. We used these guidelines for the Food vs. Lipstick Challenge. Basically our aim is to find the best lipstick product that holds true to the taglines -long-wearing, no smudge but making sure it won't harm our lips. Since Monika brought different brands and colors of lipsticks, our first task was to find a color that suited us and saw to it that it won't dry out our lips, since we will be applying and removing them and re-applying. This fun task may or may not harm our lips, like parching. It's been found to be a common problem with long-wear colors, but the good ones keep moisture levels intact. Testing Notes: We doubt that any cosmetic chemists use the pizza test, so we did it. Verdict: Mac kept my lips moisturized from the time I had it applied but it easily transferred to my pizza. The color has to be able to withstand heat and humidity. Steaming pots can make a hot mess of makeup, particularly in the form of smears and smudges. We watched for both. Testing notes: Some of us noted time of application, then subjected products to the warm dishes served by CK. I tested this with hot tea the soup served with the Triple Decker Club Melt and the pasta. Verdict: Amongst the products I've tried, Flormar, Nyx, Mac, M & Co., I didn't find one that passed this criteria. 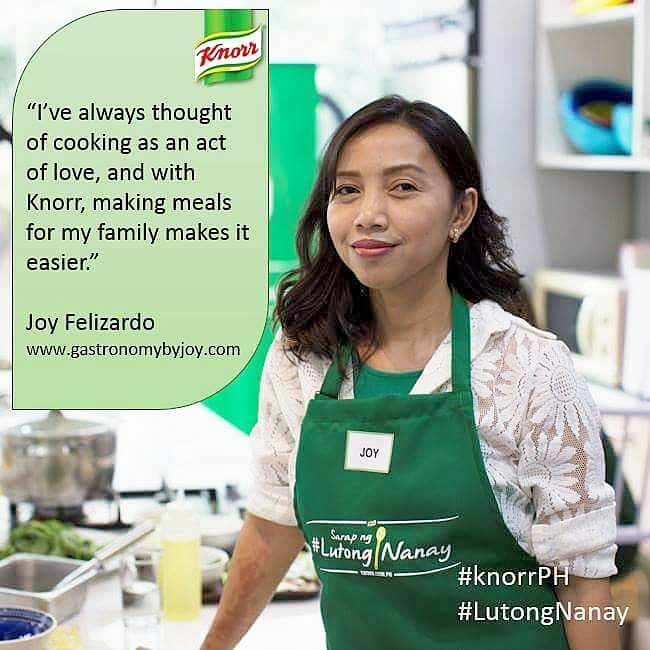 Here, my friend Joy used my Flormar and ate her portion of Squid Ink and Clams Pasta, now check out her lips. We subjected lip colors to the chosen specialties, sandwiches, soup, salad, pasta and smoothies. Testing notes: Every time we ate, we checked to see if there was any lipstick fading. Drinking water probably is the first thing diners do upon sitting on a restaurant table. Another thing usually bugs me are the lipstick stains on my coffee mugs or cups, so we also monitored our mugs, and beverage glasses. Testing notes: Whenever we took a sip, we checked our lips and the rims of our glasses. 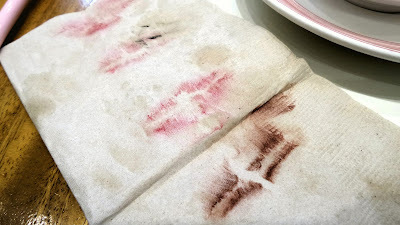 Short of an after-work date, there's nothing better than a napkin for determining whether a lipstick will kiss right off. Testing notes: Some of us used napkins to see if the color would kiss off. After we've tried several lipsticks and indulging with our epicurean feast, here are some tips my friends gave. Think about your food choice. I'll eat huge burgers with lipstick on, but sometimes the lipstick comes off on the bun. It's generally best to order food that requires utensils and can be cut into smaller pieces. All it takes is being a bit more mindful of how you use your fork or spoon! It's just a matter of biting down with your teeth more so than your lips. Finger foods are not usually a problem as long as they are bite-size and I'm able to pop them right in my mouth. Nothing bugs me more than when I take a bite out of something and lipstick ends up on my chin or nose. It takes a big bite to make that kind of smudge, but it happens and it's the worst. Take smaller pieces of what you're eating when at parties so that the food won't touch your lips, and always carry a small compact with you so you can slip into a corner and check your lips after eating. Mela suggested her all-time fave lipstick brand, Happy Skin Lippies. For according to her, she only apply in the morning and never minded to reapply during her work day. Had I known about Wet N Wild's Megalast Liquid Lip Color, we all should have taken it to consideration. Along with intense and hip lip colors, it boasts of being transfer-proof and long-lasting. I should have bought one or some colors for that matter at Zalora online shop. Zalora Philippines offers Wet N Wild online! Check out http://www.zalora.com.ph/wet-n-wild/ to know about Megalast and other cool lipsticks and Wet N Wild stuff. So be sure to do that. All in all, the event was such a fun-success! After all, the food in Chelsea Kitchen was indeed a tough challenger for Monika's lipsticks. Let me now share you what we had on that lunch. We first had the Sesame Seared Tuna and Mango Salad (P 350). The colors in the bowl says it all - fresh, healthy and all-yummy. I love the half cooked Tuna slightly covered and seasoned with black peppers and sesame seeds. A hodge-podge of a salad, it has all my faves in it, lettuce, lola rosso, tomato, carrots, scallions and ripe mango. Served with two sauces, ponzu honey and sweet miso sauce. Six pieces of these Crispy Hot Wings (P 295) is enough to ruin my lipstick, I don't mind!!! The blend of sweet and not too spicy flavors gives me enough reasons to forget about my make up, it's that scrumptious. It has carrots, cucumbers, and jicama and serve with an aioili. 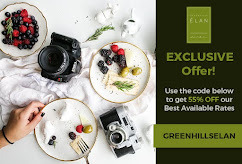 Stone-fired pizza, brick oven pizza and also wood-fired pizza, these are just the rustic way of creating a traditional Italian pizza and I must say that the 12" Super Garlic Cream Pizza (P 250) serve to us was what I was expecting for in a true-blue pizza. I belong to a pizza-lovin' family and I would recommend this in a heartbeat. It was something tweaked but love how they added the toasted tinapa flakes on top of everything. 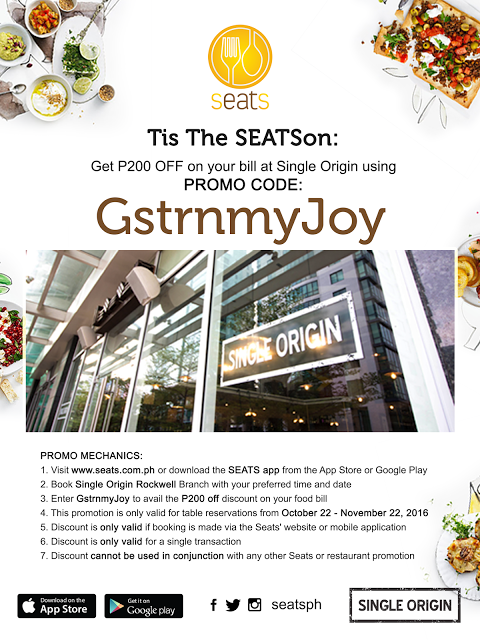 Most of the people I know who have eaten here have raved about the 4-Hour Cola Ribs (P 450). Now, I've joined the bandwagon. It was simply delirious, though I was a bit caught up with the lipstick challenge, up until now the savoriness of the sauce and the "uber" tender pork meat still lingers in my thought, and as I'm finishing this post up, I'm dying to get my hands on these. I believe in what cola drinks can do to meat, either as a marinate or as a sauce extender, it does wonders. Every time I make chicken barbecues or roast a whole chicken in the oven, I make sure that there is a hefty portion of colas (or sodas) set aside, for drizzling or in the marinate. I guess I really picked the perfect place for this event and Chelsea Kitchen knows how to support our cause. The Squid Ink and Clams Pasta (P 320) was beyond comprehension the winner when it comes to this challenge. It has that scary black sauce that evenly penetrated every ingredient of the dish. After every mouthful, licking your lips would be a must. Even the classiest gourmand would likely attest to this. Made less scarier with angel hair, a thinner pasta, was used and clams were a good compromise to this. Merry Mela's top recommendation is the Ultimate Grilled Cheese (P 295). How can I say no to three different kinds of cheeses melded together inside two brioche breads and grilled to a crusty perfection. The wholesome serving were brought on a wooden tray with fries, Cappucino Tomato Soup. Grilled pesto chicken, farmer’s ham, egg salad, American cheddar, romaine, and tomatoes. were sandwiched in between two sliced foccacia. The Triple Decker Club Melt (P 320) is a steal for that quick lunch without being bloated and guilty. It is served with fried sweet potato. It was no ones birthday but who cares, we just had to try their Birthday Cake (P 195). Listed under their artisanal cakes, it's a heavy vanilla pound cake smothered with buttercream icing. It wasn't that spectacular no new taste just the saccharine to break the savory. Chelsea Kitchen is a mix of different cuisines and their comprehensive menu listing is something worth looking at and trying. They're so easy to spot, making the perfect venue for group meet ups and family dinners. I had fun with these lipstick divas and can't wait to come up again with a crazy event for my friends in blogging. Thanks Chelsea Kitchen and Raintree Restaurants for accommodating us.